Entertaining, comfort, and fishability meet, in one dual console package. Dual console boats are incredibly popular due to their versatility, and one of the largest to hit the market lately is the Pursuit DC 365. Yes, there is a down-side in trying to create a multi-purpose platform, in that boats designed to handle everything from entertaining a crowd to trolling for tuna tend to less than ideal for either specific purpose—or any of the other multiple uses they may be suitable for. But Pursuit found a way to make the DC 365 transform from entertaining to fishing in quite an impactful way. The key lies in the cockpit; tune in for this First Look Video we shot at the Fort Lauderdale International Boat Show, to see exactly what we mean. 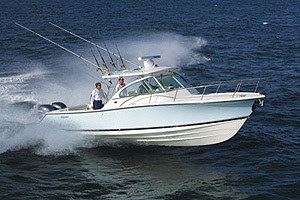 The open, uncluttered nature of that cockpit in its seat-less form is exactly what anglers want and need in a dedicated fishing boat. But the DC 365 accommodates your piscatorial pursuits in a number of other ways, too. 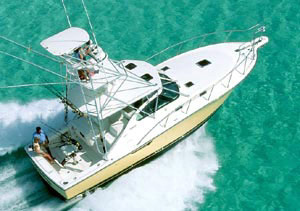 Standard features include a brace of five rodholders in the transom and four in the gunwales; a cockpit tackle center integrated in the aft-facing seat; fishboxes with diaphragm pumps in the cockpit deck; and a 28-gallon recirculating livewell in the transom. But our favorite fishy item was that brace of vertical cabin rodholders, which makes it easy to stow a full complement of gear out of the weather and under lock and key without removing it from the boat at the end of the weekend. With all those fishing goodies built in, what are you sacrificing with the DC design? 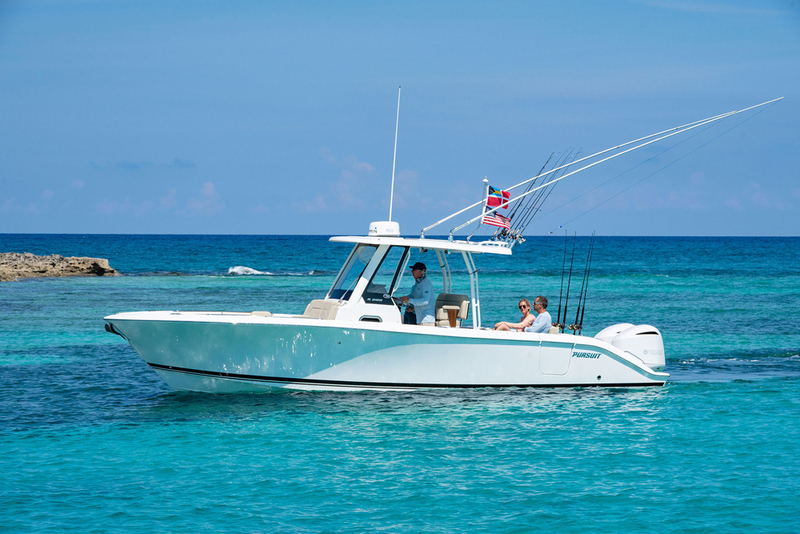 The biggest is the ability to follow a fish 360-degrees around the boat, which is only do-able with a center console or (very few) walkarounds. The bow cockpit is also not ideal for angling, due to the built-in seating. Still, there is room for an angler or two to cast from up front and all things considered, the DC 365 gives you just as much angling access as you could reasonably hope for in any dual console boat of this size and nature. 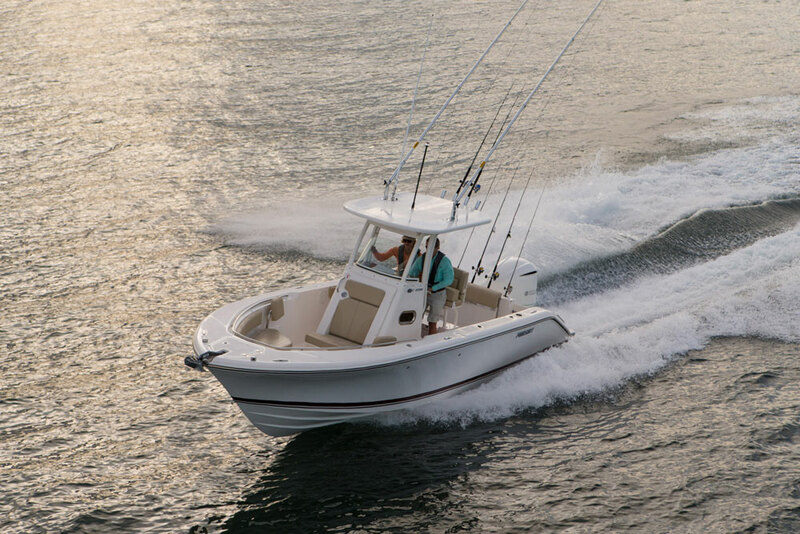 Whether you’re going fishing or cruising, the DC 365 is designed to fit the bill. What you get in return for those sacrifices is rather difficult to argue with. Start with that bow cockpit. There’s room and seating up forward for four people to sit, or for two to completely kick back and prop up their feet. Fold-out arm rests, a stereo-remote, a pair of USB ports, and stainless-steel cup holders boost the comfy-quotient. And the removable, height-adjustable table and the addition of the filler cushion lets you turn the entire bow cockpit into one huge sunpad. What’s even smarter is how Pursuit designs in dedicated stowage for the removable items, reducing the clutter-factor. Another big bonus is the bridge-deck, which will keep the entire crew protected from the elements and comfortable even during runs through open water. The port-side seat is really a combination settee/lounger, and is padded both fore and aft so you can kick back in either direction. The helm chair is double-wide. When the folding center windshield and the lower folding door are both deployed, this area of the boat is sealed off on the front and both sides. If conditions are calmer and you want to enjoy the fresh air as you cruise, swing the enclosures open and slide back the huge sunroof. Or if it’s blazing hot outside close it all off again, and fire up the air conditioning system—it not only chills the cabin but is also piped in to the bridge-deck. We like that port-side lounge, but what we like even more is the chilly breeze provided by the helm-deck air conditioning vents. The DC 365 is also large enough to house a substantial cabin, which brings weekending and overnight fishing possibilities into the mix. It has Ultra Leather-upholstered settee and a digital media center with 28” LCD TV for relaxing, but more importantly, Pursuit has managed to squeeze in not one but two berths. They accomplish this by orienting them athwartships, instead of fore and aft as one would expect. Each berth has sitting headroom (under the passenger’s side bridge-deck seat and the forward cockpit seat) on the port side, and laying space running under the deck. Another reason Pursuit is able to maximize cabin space is that they locate the head (which includes a stall shower) in a separate compartment, accessed via a side door in the helm console. What about a galley? Pursuit addresses this issue by mounting a microwave inside the cabin, including an electric grill and a sink in the cockpit entertainment center, and locating a 1.3 cubic foot refrigerator/freezer underneath it. We wish there was a bit more refrigerator space aboard and think a lack thereof will be the biggest issue with weekending on the DC 365, but in the same breath acknowledge that many boats of this size and nature are a bit short on fridge space. The bulk of the food prep will take place above-decks at the entertainment center, but there’s also a microwave oven in the cabin. We hate it when we can’t take a boat like this off the dock, but at the Fort Lauderdale show, obviously, this wasn’t possible. 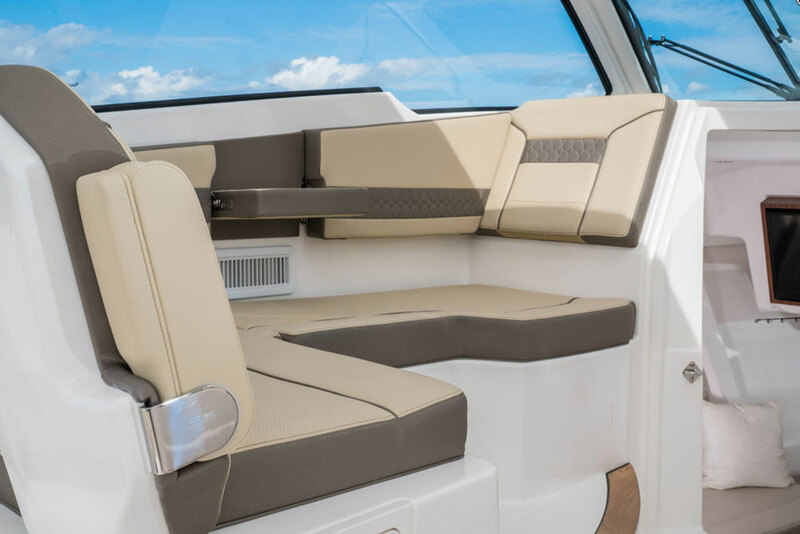 Fortunately, we can still get a good idea of how this boat will perform thanks to its similarities to the sister-ship Pursuit S 368 Sport center console. 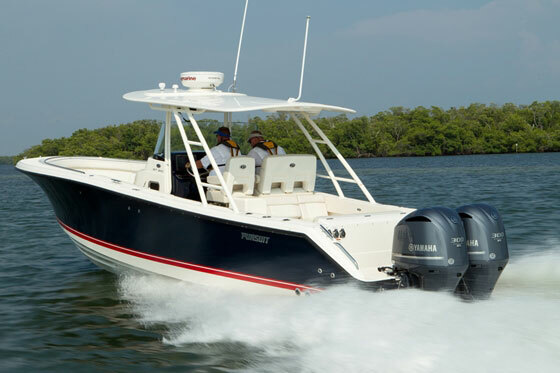 These boats share the same LOA, beam, transom deadrise, and standard triple 4.2-liter Yamaha F300 outboard power package. And the S 368 cruises at 36.5 MPH at 4500 RPM, and tops out at 49.1 MPH at wide-open throttle. Efficiency is just a hair under one mile to the gallon throughout the cruising range, and drops to 0.63 at wide-open. No, the DC 365 won’t post identical numbers, but they will certainly be in the same ballpark. So: what are we missing thus far, in our discussion of the Pursuit DC 365? 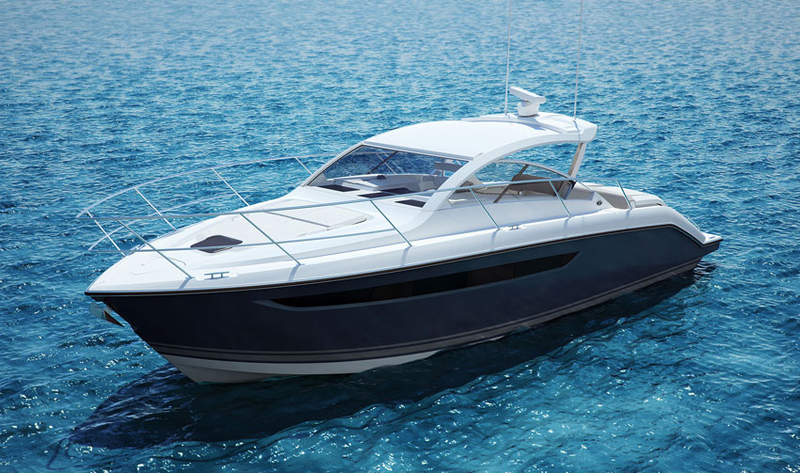 A boat review of this model simply isn’t complete without taking note of the standard features that come with it. We’re talking big-ticket items here, like a bow thruster with joystick controller, an anchor windlass with a 22-pound stainless-steel plow anchor, a JL stereo system with six speakers and two sub-woofers plus an amp and remote, auto-retracting Lenco trim tabs with indicators, and more. When comparison shopping you have to keep this stuff in mind, because some boats will appear to under-cut the DC 365’s price (a hair under a half a million) but will suddenly seem like less of a savings when you figure in the cost of these items as options. And that’s not even considering the construction features incorporated into the DC 365, like the foam-filled infused fiberglass stringer grid, five-ply infused transom with reinforcing grid, and vinylester resins (which are less water-permeable than cheaper polyester resins). 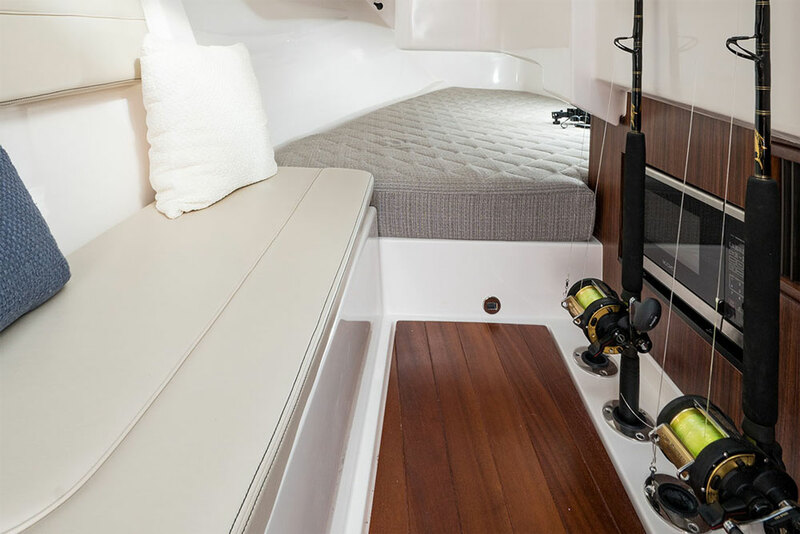 If you want the ideal dedicated fishing boat, look at a center console. 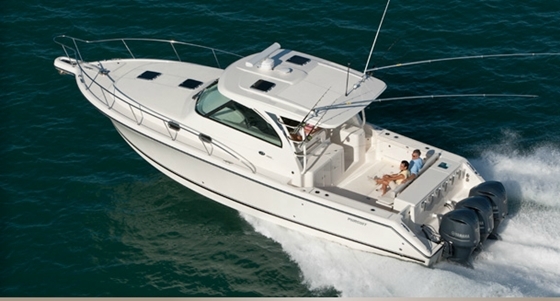 If you want an ideal cruising boat, look at an express cruiser. 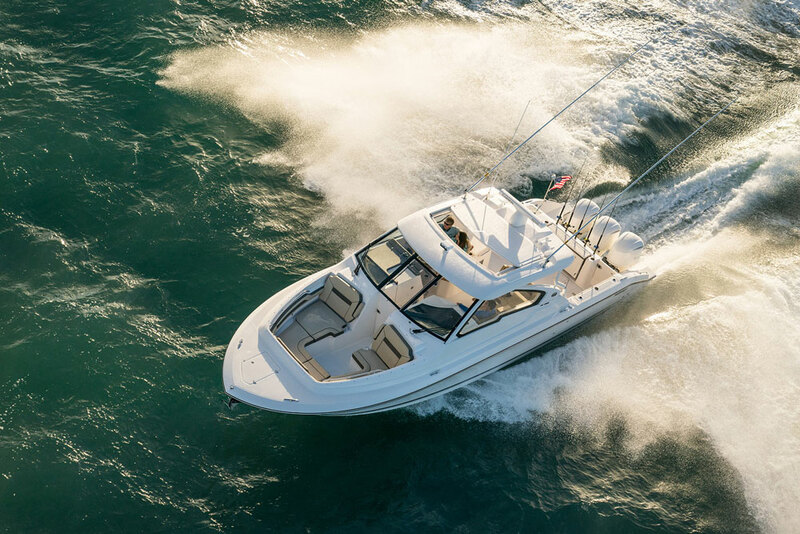 But if you want a boat that can both fish and cruise – and can dabble in watersports, entertaining or just about anything else – then take a gander at a boat like the Pursuit DC 365. Other Choices: Though we’ve seen dual consoles growing larger and larger in recent years, few are quite this big. One that comes close is the Grady-White Freedom 335, which places a bit more emphasis on fishability and a bit less on the cabin. (Grady-White also has a model that’s larger than the DC 365, the Freedom 375). 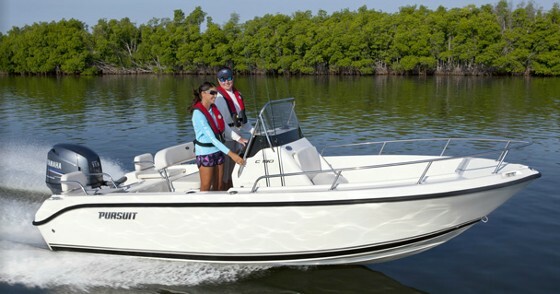 Another multi-purpose DC that might be of interest is Boston Whaler’s 320 Vantage, which is a bit smaller but also a bit less expensive and runs on twins instead of triples. See Pursuit DC 365 listings.